25 Days of Blogging: Christmas Challenge-Day Twenty-Five: It’s Christmas! I hope everyone had a great day! For my readers who do not celebrate Christmas, I hope you had a wonderful day as well. As far as presents go, I got a bunch of books, a tripod for my camera, an owl smoker (for incense), a few reed diffusers, and many other things. Everything went as planned; family came over, we all opened presents, ate dinner, and talked for hours. Everyone just left a little while ago, that’s why this is going up so late. Wrapping Presents! Duh! Which I actually just finished doing… And I’m happy to say that we will be having a White Christmas! I hope everyone has a Happy Christmas and if there’s snow where you are, please drive carefully! 25 Days of Blogging: Christmas Challenge-Day Twenty-Three: Plans for Chirstmas 2012? As always, we will open our stocking while everyone has their morning coffee, and I have tea. Then, when family gets to our house, we will have breakfast (probably around noon). After that, we will finally get to opening presents. Then we just sit around and talk for the rest of the day until dinner. Pretty simple and relaxing day. 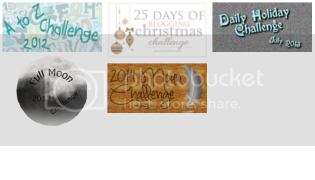 25 Days of Blogging: Christmas Challenge-Day Twenty-Two: Eggnog or Chocolate? Hot chocolate! I know, i know, everyone loves eggnog and blah blah blah. I like hot chocolate. When I was little, we always had hot chocolate waiting for us when we came in from playing in the snow. That was back when it actually snowed in winter. Anywho, Christmas is about finding the child inside of you. So, as a child I drank hot chocolate, so hot chocolate it is! 25 Days of Blogging: Christmas Challenge-Day Twenty-One: Do You Travel on the Holidays? Nope! Everyone comes to me! People usually come to our house because we are the biggest family and the have to most space in the living room. It makes more sense to have everyone come to where the most people already are. I like the whole meal! We usually have ham or turkey. I like the ham more since we just had turkey a month ago during Thanksgiving (and the week after). But I think my Mom likes the Turkey better because it’s less salty. Anywho, I just like the food. Its been a few days. I didn’t forget. The website that provides the daily prompts for this challenge was down. My favorite stocking stuffer would have to be the candy. It’s really the only thing that’s consistent every year. Usually may family just puts the smaller gifts that aren’t big enough to worry about wrapping in our stockings. Its nice to get a few small things in the morning while we wait for extended family to show up. But the candy is always good! 25 Days of Blogging: Christmas Challenge-Day Eighteen: When Do You Open Gifts? We usually open gifts around noon on Christmas. We don’t do any of that open one gift on Christmas Eve stuff. Not that there’s any thin wrong with that.. I just like opening everything at once. Unfortunately, when I was younger, it was hard to wait for family to get to my house and then everyone had to eat breakfast. It took forever to actually get to the presents. It’s not so bad now, but sometimes, I just want to open presents! These are a few old cards I found. I thought they were cute and I couldn’t decide Which one I liked best so I chose them all!